Sometimes, clouds blindfold a docile blue sky from behind with dirty wool. Not as an entrée for a round of Pin the Tale on the Donkey, but violently. On rain days, the bedroom window of the neighboring rental never opens. Blinds buttoned to the lip of a sill not eight feet from my own prevent glimpses of the naked to-ings and fro-ings I catch on occasion, buffer strains of music and conversation. Absent, even the blue jay—no aubade of screams and hawk mimicry from his post on the chain link fence dividing the canal of pebbles and patchy beach grass between our properties. No, on rain days, blankness multiplies—Cape Cod Colonials, a study in whites and grays, perhaps a faded red windbreaker scurrying out of sight. As innocuous as a Hopper painting. Is that why I accepted the ride? My bike tire had blown a tube, and besides, it was raining. Except no one would have seen my bicycle being loaded into the back of the black truck, because I’m not the one who made it that far. I only made half of a mistake. I’m obsessed with Law & Order. With the BBC’s Prime Suspect and Wallander. Dexter and CSI: All Four Hundred Versions. Yet, I wouldn’t say I actually like crime or violence, despite the categories dominating my Netflix account—Visually Striking Crime Dramas, Thrillers, Dark Suspenseful Psychological Dramas, Violent Movies. I cover my eyes during fight scenes and suffer from nightmares after watching certain movies too close to bed. Don’t even talk to me about what watching Twin Peaks, even a full decade after its appearance on network television, is doing to my REM cycle. And yet, I can’t stop. For the past few years, I’ve tried to figure out why I am compelled to finish watching an episode or movie or finish a book even when the conventions of the genre pretty much guarantee I can guess what’s going to happen. Even when I know that ending will not bring me anything but the weakest shadow of mimetic relief—whether it’s because the process of reaching an ending involves a slew of violent murders where women’s bodies figure too prominently and too sexually, or because I distrust the closure offered by handcuffs. And yet, I crave that ending. People have told me that in Provincetown, I don’t need to lock my door. But I do, after my husband warns me about a string of break-ins happening in the Lake George area. Apparently his mother had told him a woman was alone in her home when one of the break-ins occurred. 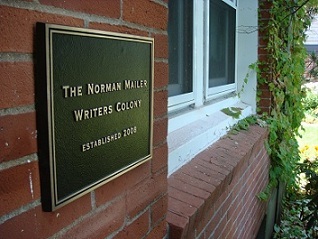 I’m thinking even more heavily on this subject after hearing Mary Gaitskill read her short story, “The Other Place,” here at the Mailer Colony. I was struck not only by the story, but also by her explanation of its inspiration. How her fear of staying alone in a house on a college campus, aware of her vulnerability, led to a story about a father and his son who both deal with potentially psychopathic tendencies. Though not a piece of genre fiction, Gaitskill’s story plays with the conventions of the psychological thriller/crime drama. By turning the proverbial lens toward the question of the cultural production of violent sexual predators, she interrogates her fear while disrupting a genre reader’s expectations with a twist at the end that can be described both as chilling and hopeful. Yet the story could hardly be called comforting, reiterating as it does the sheer mundanity of our cultural narratives of sexual violence against women. A man who claims he is writing a book about “men and women” accosts a friend at the Provincetown Library. Would she like to get a drink later? She says no, refuses to return to the library to work. We decided to label this a smart decision based on unfortunate circumstances. The town is small and it’s hard to know whether the guy is a local or on vacation. We decide it’s not worth the risk, though she has not seen him again. A few nights later, a group discusses the murder of a young woman in NYC a few years ago over dinner. A tragedy, of course, though a few of us wonder whether she could have prevented her own death by deciding not to go out drinking alone. I sit with the suggestion of the limits of our ability to feel compassion when it means challenging our notions of our own security. I sit with the worldly “realities” that fence a woman’s existence. Later, we list all the risks we took that we would never take again, knowing what we supposedly know now. Sleeping on a beach. Accepting an invitation to a stranger’s home. Walking home alone late at night. We grudgingly acknowledge that any of us could have been a murder victim. Half a mistake. Trudging up a steep hill against traffic, I squint in the distance for headlights. Parked cars sit silently on both sides of Provincetown’s busiest street. City logic—numbers mean safety. In the corner of my left eye, something dark flies out suddenly. A dull clang. Hello, pavement. My bike’s good tire is wedged under my right calf. How did that happen? I think of skid-marks, traffic. Reach to pull the bike out of the way, realize I’ve lost perspective—no idea how far I’ve fallen, where exactly I lay. A childhood fear wells up within—Come on, let’s play the game. A neighborhood version of Chicken. Don’t get up until you see the car tires coming. Sweat pricks hot under my soaked jacket. If the other person can’t see you, it’s not really Chicken. Get up. Get up. No one can see you lying in the street. I’m not alone. Someone will see me. Everything’s going to be—tires’ soft screech—another voice, sneakers squishing in the rain—okay. Half a mistake. Not paying attention. Standing, I’m a little woozy, but everything appears to be working. “It’s okay . . . I’m okay.” Embarrassed, I try to laugh it off while the middle-aged woman who pulled over rights my bike. The man standing next to the black truck has the hood of his jacket pulled over his head. His hands are in his pockets. His shoulders slump forward protectively. Doored while walking. I’m too surprised to summon any anger. Later I’ll be angry. For now I’m just breathing. It rains harder. An awkward silence, then the woman offers me a ride. I accept gratefully as the man slides into the cab of his truck. Lock my bike to a tree. Slide into the dry car seat. Watch his taillights get smaller in the side-view mirror. Two days later, I hear on the news that a young woman is missing. The news anchor is my age, maybe a few years younger, though her hair looks like a confection out of the 1960s—shiny chestnut, sprayed into shape. It looks as though it might lift off in one piece. She mentions the young woman was last seen loading her bike into the back of a black truck. Tells me if I have any information I should call the police. Blinks. Reads the next story. Mandy Malloy, an Army brat who calls Florida her native home, is a writer and graphic designer currently living in Brooklyn, New York. A graduate of Hunter College’s MFA Poetry program, her poems have appeared most recently in The Portland Review and Hot Metal Bridge. Visit her blog here. Mandy is also a Mailer Poetry Fellow. She is using the month of residency to work on her first collection of poems and to explore her fascination with the intersection of crime fiction and feminism.